6th August 2018, our classic made-to-measure plantation shutters were installed in a glorious villa in Jumeirah Dubai, United Arab Emirates. This magnificent villa we’re talking about is just in front of Burj Al Arab and we can’t get enough of the interior. 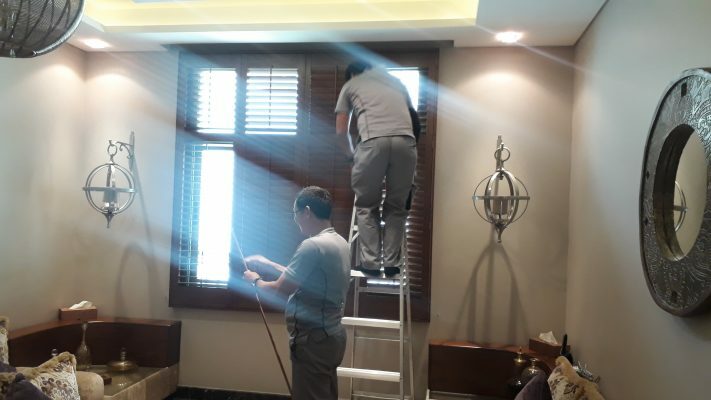 Our expert team of Emirates shutters was employed to set up shutters in the windows of living room, kitchen, bedroom and balcony of this luxurious house. Not to mention, our customer’s family is also one of the most renowned families of the Middle East and it was great window styling for them. Since the family is currently living in Jordan and will be vacationing in Dubai soon, our free online appointment booking facility gave them a way to schedule the home visit from Jordan only. Isn’t that convenient for all the people who want to re-style their UAE home with our exclusive plantation shutters? Our appointment scheduling is designed to provide ultimate user friendliness to the customers and can be arranged by visiting Emirates Shutters website. It Feels Great To Be Recommended! Looks like the news of Emirates Shutters ’quality and variety is doing the rounds and it makes us feel so proud of our team. We got to know from our on field interaction with the customer that their relative recently got shutters installed by our experts and actually recommended us to them, which makes us want to thank all you valuable clients for spreading the love of window styling in our name. It was an interesting day with Emirates Shutters when they had their hands full with 4 shutters installation all in one house and as usual the proficiency and hard work of our technical experts never fails to amaze us. 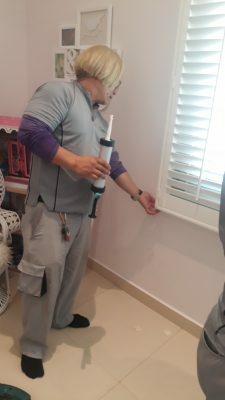 It all comes down to the customer whether they want to remove their old window treatments before the appointment or our team can also do it for them. 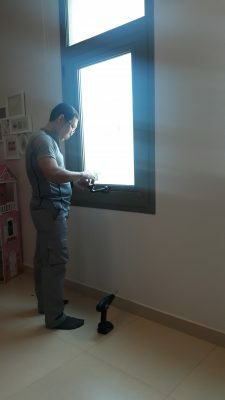 For instance, our recent shutter installation in Jumeirah the customer and their family were not available and they requested to make the necessary arrangements to get the job done perfectly and we certainly did! 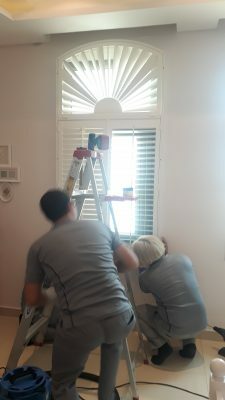 Our team of 3 included Mr Fendencio, Mr Rino & Mr Kennet, they are one of our most experienced shutter fitting experts who right from the scratch prepped the windows and installed shutters in the respective window frames. Each frame was evened out and was then fixed firmly to the windows ensuring the stability of the shutters. Let us run you through the specifics of what goes into the process of getting that gorgeous window shutter appeal. 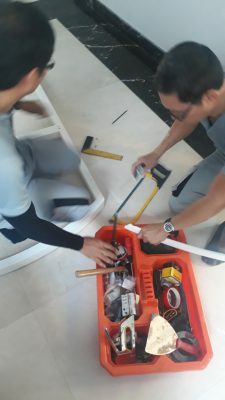 We all know that every technical installation involves tools, and in our case the basic tools required were a step Ladder because each window angel, position and curve vary & a cordless drilling machine for fitting in screws thereby preparing the window frame for the fitting. Our crew always makes sure that the frame’s surface is absolutely clean to prevent the panels or shutters from getting damaged later on. 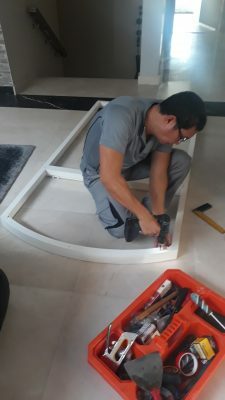 Moreover, the holes are drilled into the walls surrounding the window frames and then the screws are fitted into those predrilled holes making the area ready for shutters installation. Quick Tip: if you’re ever installing the shutters yourself, make sure that the frame is built nearest to the window to avoid any unwanted movement. This step varies from window to window and the type of styling the customer requires. There are two types of fitting; Recess Fit where the shutter is installed inside the window’s board and Face fit where the shutter is installed outside the window’s frame. In our recent fitting our customer wanted us to provide them a face fit shutter installation for two reasons, firstly their windows were small in size and they wanted to make them appear bigger and the other reason was because they wanted to give a unique shape to their windows. Finally, at the last step of the installation the panels are fixed in the window after ensuring that the frame is secured. Our technical experts told us that it is very important to make sure everything is lined up evenly and that after installation the shutters open and close with ease for the perfect window shutter experience. After installation our team also makes an effort to give final touches to the shutter by covering the gaps with silicone sealant. Emirates Shutters is known for its smooth service and for us delivering the perfect product is just not enough. 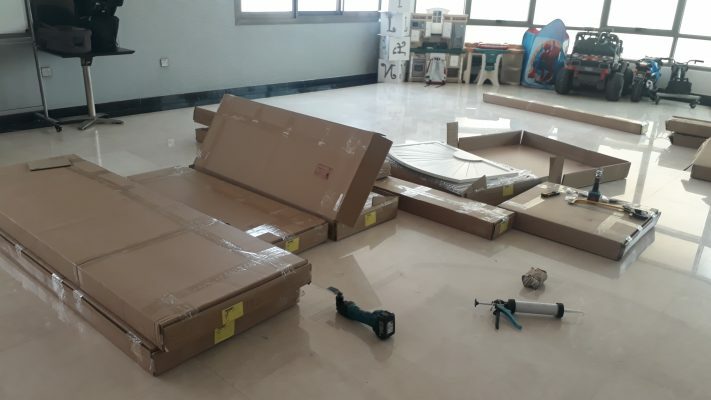 Our team is trained to ensure that after installation there is no inconvenience caused to the customer, especially with any clutter caused during the fitting. Therefore, along with the tools mentioned earlier a portable vacuum cleaner is also a must carry for the crew to all their installations. It is all because of the extreme efficiency shown by the experts that Emirates Shutters have managed to create a place for itself at the top tier of the window treatment industry in the UAE. Big applause for Mr Fedencio, Rino & Kennet for letting us experience their flawless installation this week! Wondering how your shutters will be installed? Go back to the first step of appointment scheduling and let our professional crew do the rest!